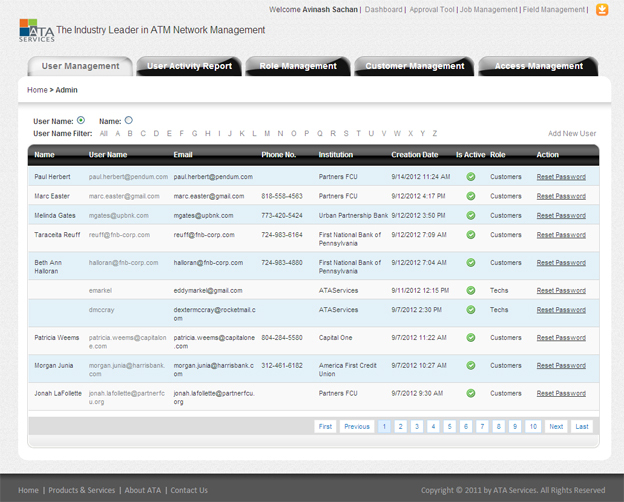 The Client is leader in ATM network management. 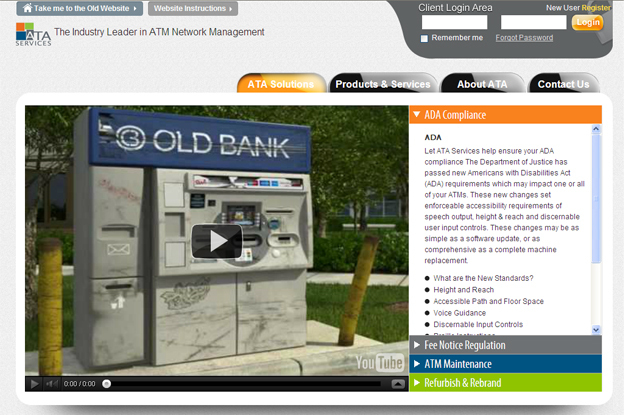 ATA has helped institutions manage their ATM networks and stretch capital expenditure budgets. Its headquarters in Salt Lake City, Utah, ATA oversee our national network of expert technicians who service more than 50,000 ATMs annually for nearly 150 institutions. 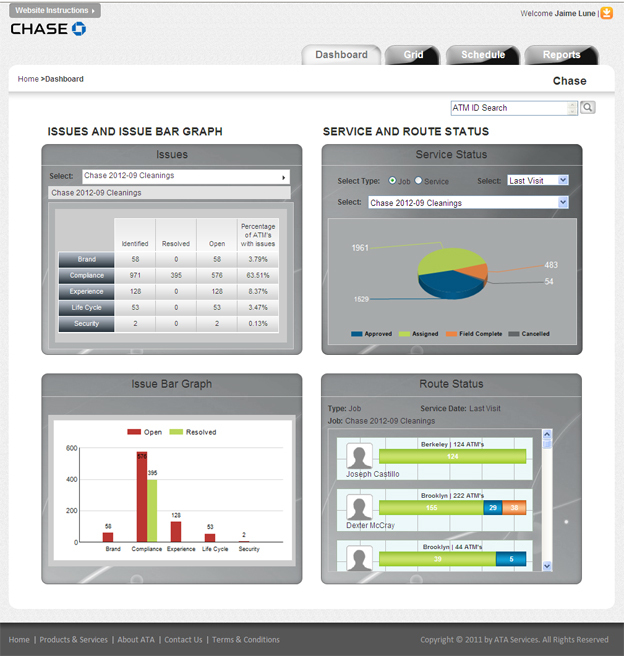 Dashboard: It will display Bank summarized data through graph and pie chart. 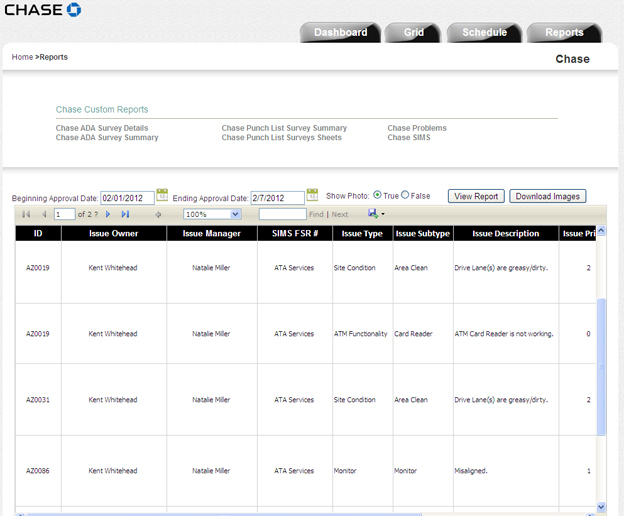 Grid: In this page all ATM will we displayed with service date and summary. ATM Profile: ATM profile display entire services record for that ATM. Schedule: User can export schedule data with the help of filter option. Reports: For further use to technician, Issues report can be exported from here. Application can be access by any of the following type of user. 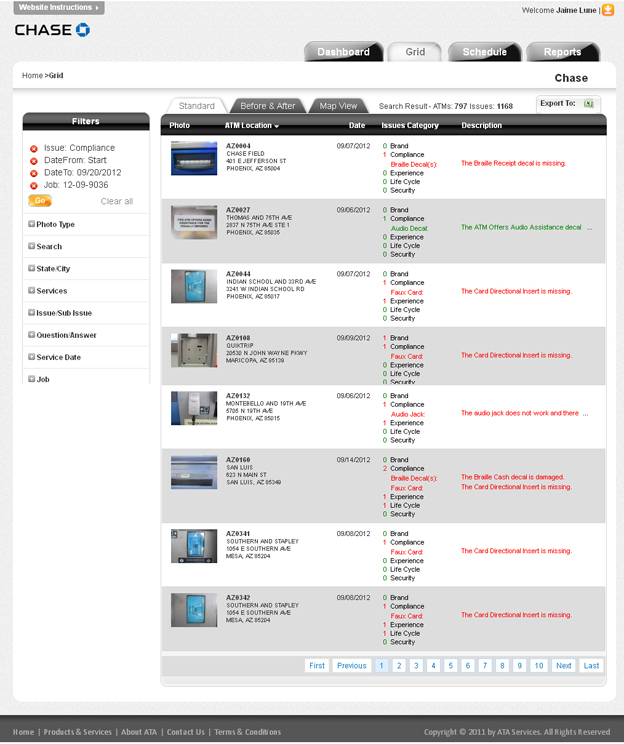 1.Customer Home page: Once user logged in application then below page is displayed where user can see all details of the issues/services/repairs’ and technician status. User click in any blue graph at any status then it will redirect to Grid page when ATM details are displayed. User can update personal profile after login. 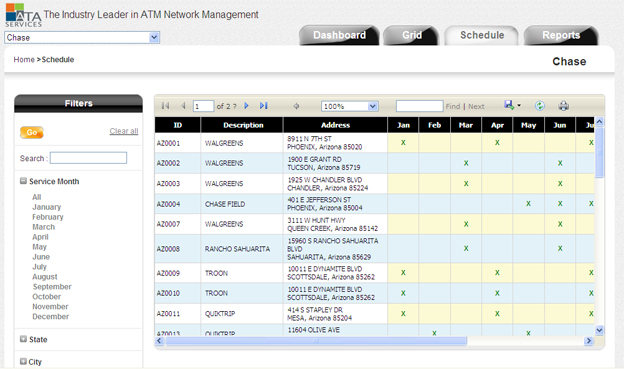 2.Grid Page: Grid page displayed ATM location and services date with summary for each services which are done for that ATM. User can have filter option on this page to select particular ATM, services etc from right side filter option. 3.ATM Profile: Users click on ATM image then it will redirect to Profile page of that ATM. It contains Profile, Photo and ATM history Page. Click on prev and next link then another ATM profile is displayed. II.Send this page: Entire page can be send to anyone to which you want to share that page, when user click on link of email then that ATM details is viewed with login. 5.Reports: In this section user can view complete issue reports of the bank, they also search through particular ATM and/or Date range. B.Admin Dashboard: When admin login then application interference has been changed with admin privilege.Click on Admin link, its redirect to Admin control of the ATA services. 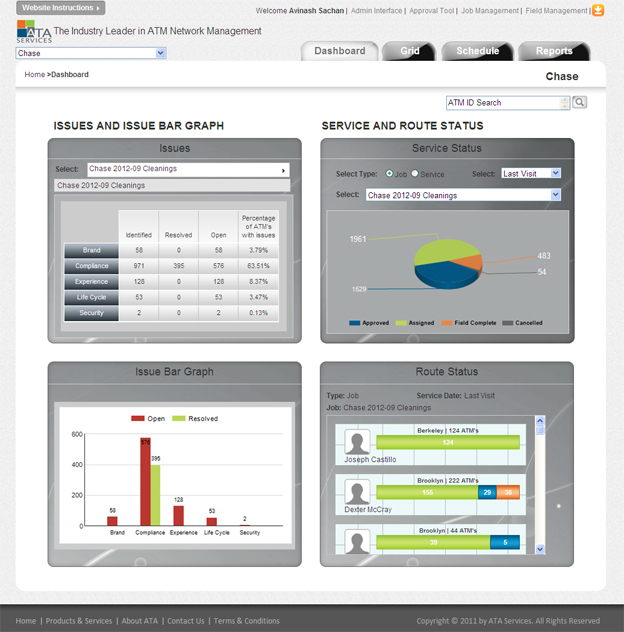 Administrator is able to manage everything from admin control panel. 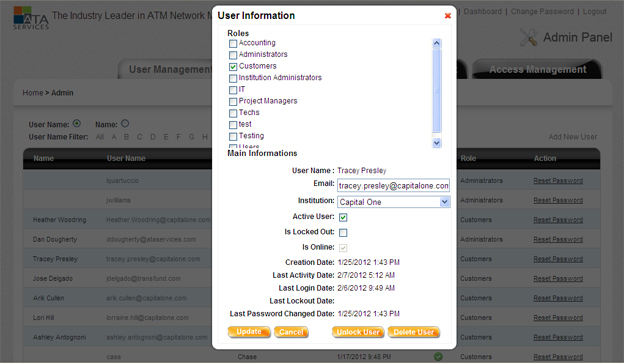 Admin is able to update any user account through admin panel. 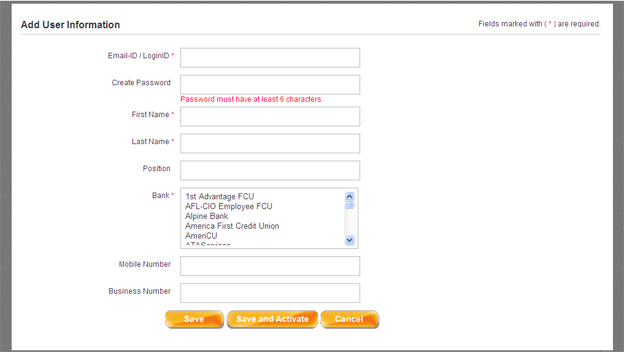 Admin also can create account from admin and share login credential to user. 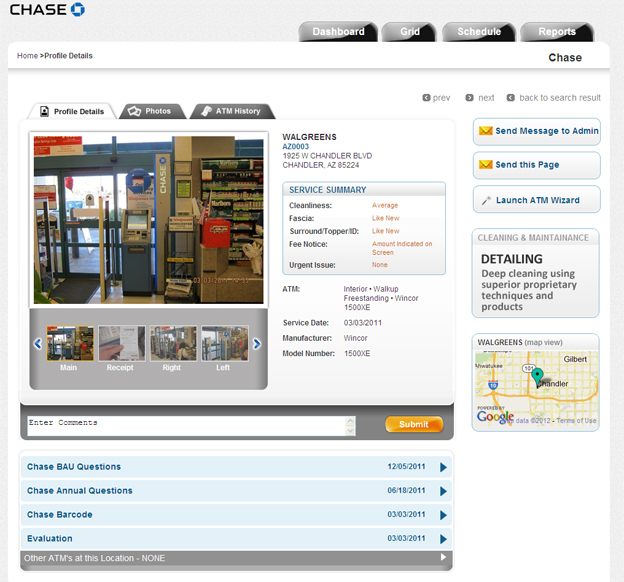 In ATA we found a challenge to display the ATM photos from cloud to our ATA website. Improving application performance for multiple users. To Display ATM photo at run time, AZURE technology is used to download photo from one location (Cloud) and putted in ATA server on run time.